This article highlights trends in timber and timber product imports. It also addresses the implications for farmers and foresters growing special-purpose timber species and owners of sustainably managed indigenous forests. Most New Zealanders love timber. We have used it for practical reasons and to satisfy decorative and cultural needs since people arrived here. Our forests and timber are woven tightly into our cultural heritage. At first, indigenous timber was all that was available but as shipping developed, this was complemented by imports of timber from Australia and North America. By the 1920’s, three quarters of New Zealand’s forests had been cleared and 90% of that was burnt, mainly for agriculture. Early last century, New Zealand began planting large areas of exotic plantations in response to predicted timber shortages and now has over 1.8 million hectares, primarily radiata pine (90%) and Douglas fir (9%). Before the 1970’s, the ready availability of native timber for all sorts of purposes was taken for granted. This changed as the public’s environmental awareness grew and environmental organisations applied direct pressure on government to stop the ‘destruction’ of our indigenous forests. This pressure has resulted in a plethora of legislative changes reaching back decades which have directly affected the management of our indigenous forests and the availability of New Zealand indigenous timbers. These changes lead to the dis-establishment of the NZ Forest Service, the establishment of the Department of Conservation, the closure of Timberlands West Coast and controls on the harvesting of indigenous forest on private land via the Forests Act 1993. The Resource Management Act and the New Zealand Forest Accord effectively imposed additional constraints. At the same time, radiata pine and Douglas fir became available and more accepted as structural timbers. With a wide range of basic uses, these two exotic timbers eventually removed the need for indigenous timbers to be used for such purposes. As a result of this, together with the pressures and the legislation, there has been a steady decline in timber production from New Zealand’s indigenous forests. The annual harvest of indigenous timber is currently under 20,000 m3. Irrespective of the quantities available, radiata pine and Douglas fir clearly do not satisfy all the requirements of the New Zealand timber user. Special-purpose timbers are still highly sought after. With the production of special-purpose timber from our indigenous forest constrained by sustainability criteria and standards and lacking adequate resources of New Zealand-grown exotic special-purpose timbers, New Zealand consumers have transferred their environmental footprint off-shore by purchasing forest products imported from overseas. It is of fundamental importance that very few of these imports carry any reliable ‘sustainability’ credentials. All graphs are based on MPI data. Year 2013 figures are provisional. 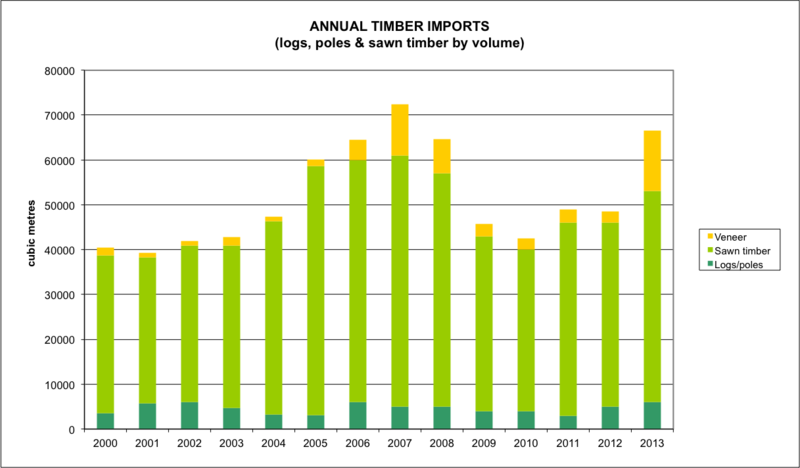 The graph below shows the volume and value of sawn timber imported into New Zealand from the main sources for the year ended June 2013. The total volume of all sawn timber imports including sleepers for the year to June 2013 is 47,366 m3 (up from 37,267 m3 for the year to June 2003). The total value of all sawn timber imports including sleepers for the year to June 2013 is NZ$57,429,000 (up from NZ$46,808,000 for the year to June 2003). Canadian Western Red cedar makes up 37% of all sawn timber imports. The main sources of imported sawn hardwood timbers are Australia, Fiji, Indonesia, and United States. 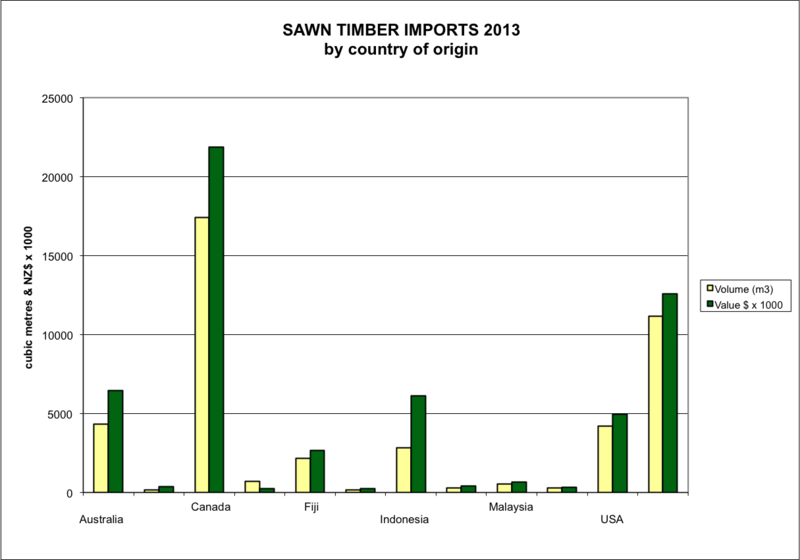 Sawn timber imports decreased following the global financial crisis in 2008 but are now on the rise again. Logs, poles, sawn timber sleepers and veneer only make up part of all timber product imports. 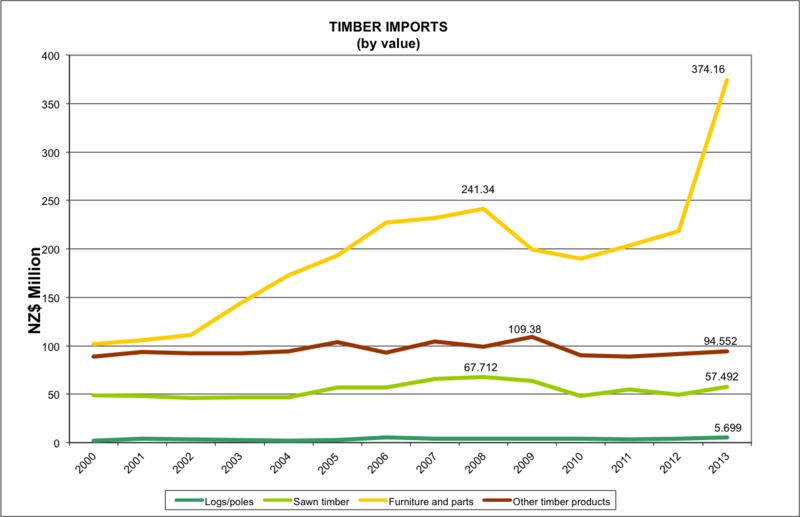 As can be seen from the graph below, furniture, furniture components and other miscellaneous wood imports make up the largest proportion of the annual timber imports. The total value of solid timber imports has grown from NZ$88,720,000 in 1993 to NZ$284,000,000 in 2003 and now to NZ$531,900,000. The rate at which the value of solid timber imports is increasing exceeds 9% per annum. The value of imported furniture and furniture components is now more than twice all other categories of solid timber imports combined. While some of these furniture imports may be radiata pine exported back to New Zealand, such reimportation is not recorded separately by MPI. In simple terms, indigenous and special-purpose timber production in New Zealand continues to decline while imports of special-purpose timber products continue to escalate. Many kiwis are happy to use imported timber products or specify imported timber for their floors, walls, ceilings, joinery or cladding without a thought as to the quality of forest management back at the source or the benefits of using NZ-grown wood. In effect, New Zealanders have effectively exported the environmental impacts of their special-purpose timber consumption to other countries and failed to recognise the impacts of their actions on the sustainability of their own forests or the viability of their own special-purpose and indigenous timber manufacturing industries. There is an obvious need to increase the public’s awareness of how their timber consumption patterns are at odds with the clean green conservation image we all cherish. New Zealander’s are unwitting partners in a double standard that requires high standards for their home-grown timbers but expect little in the way of sustainable credentials for special-purpose timber imported from overseas. The market must operate within an equitable legislative framework if it is to reflect the environmental aspirations of the public. There is a need for legislation to be developed which controls the importation of unsustainably (not just illegally) produced timber. This lack of legislation distorts the market making it difficult for NZ producers to compete. Such legislation cannot be developed in isolation of our trading partners but World Trade Organisation restrictions can no longer be cited as reasons for not acting on this. New Zealand’s environmental organisations also need to increase their support for home-grown special-purpose timbers and shine the spotlight on imports arriving without any sustainability credentials. There is also a need for greater support from government departments for the use of our sustainably managed indigenous and special-purpose timbers. Currently, the government does not have a comprehensive forest policy and the level of government support for indigenous and special-purpose forestry is mediocre at best. Regional and District Councils also have a role to play. All these government agencies could support these industries by buying NZ-grown timber, especially naturally ground durable timbers.